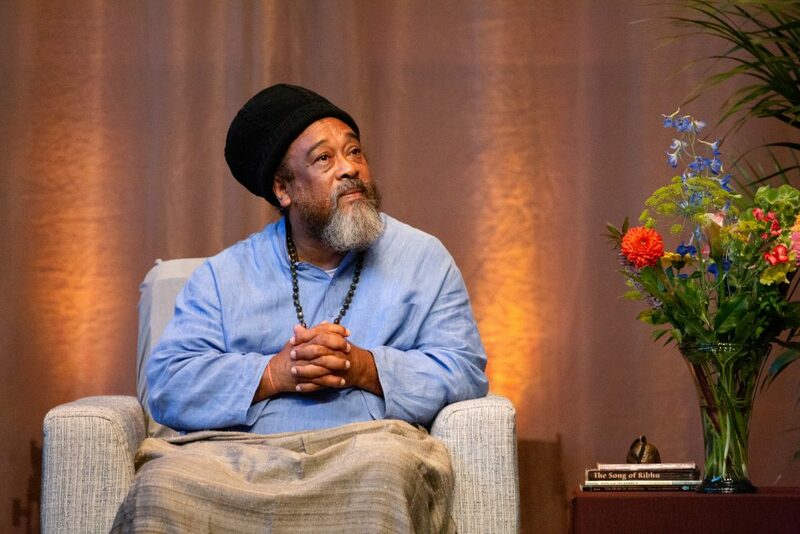 For many, Mooji, also known as Anthony Paul Moo-Young, is a spiritual guide who aims to help seekers of the Truth realize that ‘happy & free’ is our natural state of being. He accomplishes this by having us experience that, behind all our ideas, concepts, beliefs, feelings, thoughts, impulses, memories and expectations, we can come into contact with Who We Truly Are. This True Self is the still Spectator inside us, that which is calmly aware of everything, That Which IS. We could attain this ego-less state of Being if we were to let go of all our identifications. It cannot be depressed, or anxious, or unhappy, or in a hurry … it just IS. 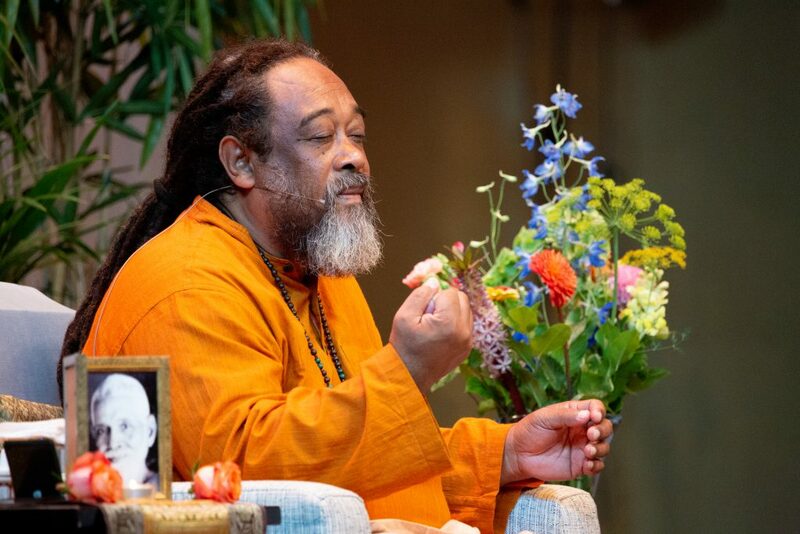 As such, going to see Mooji was certainly fitting for us as representatives of Stichting Gezondheid, which not only strives to help people with their physical health, but also with their emotional, psychological and spiritual health. 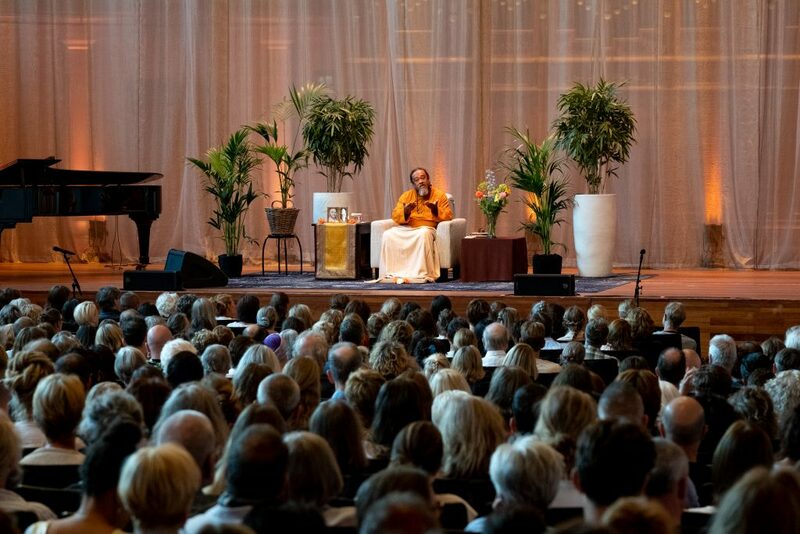 Prior to Mooji’s satsangs at the Philharmonie in Haarlem, we received a warm welcome from two serene-looking ladies dressed in ashram clothing. We were shown where we should sit. The hall was filled with people, a soft scent of incense was in the air and beautiful music was playing. Everyone in the hall became enthusiastic when Mooji appeared. His face and appearance on their own were therapeutic enough: you could not help but feel happier, more cheerful and more In The Moment. Mooji had an easy smile and twinkling eyes and he radiated a pleasant aura of love. After sitting down, he took a few minutes to calmly take in all his attendees, as though he was wordlessly blessing everyone. Some people started sobbing or weeping. Next, he told us he was going to help us let go of our identifications, to help us realize that we are vastness, tranquillity and emptiness, the reasons for the existence of life itself. He asked us to let go of everything: our opinions, problems, thoughts, intentions, attachments, beliefs, convictions, interpretations of the present, everything. All the contents of our consciousness. The more ‘naked’ we become, the closer we get to this State of Being. The hall became quiet. Mooji asked whether this Being had a birth. A death. Whether it could be limited. Or finite. Or impressed, flattered, offended. Or whether it could be owned exclusively by any organized religion … Every time, the answer from the hall was “no.” That which remains after we let go of all identifications of our ego, is The Being Present In Our Own Wholeness. It seemed as though Mooji was giving us a crash course on Enlightenment. He wanted to have us experience transcendence. The message seemed to reach the audience. Seemed, because while Mooji asked us to leave our past behind us for the few hours we were together, the people who wanted to ask questions first started talking extensively about their pasts. And though Mooji asked us not to see him as a guru but to seek our own inner guru, various women in the hall asked if they could hug him as that was their one and only wish. And though Mooji indicated that he had no identity, Indian sitar music was playing for him, probably because it fits the image we have of a guru, though he was originally from Jamaica and spent forty years in London. The greatest proof that the godly world exists is a person who reflects godliness: as he watched and listened to the people, unconditional acceptance, endless patience and boundless love seemed to pour from his heart. Mooji IS. No concepts, opinions, identifications, annoyances, doubts, judgements, emotions … Only Being. He is the living example of what he preaches. His state of being is his religion. He seems to have found the godliness in his deepest inner self and to have placed his personality in the service of that godly Being. This entry was posted in blog, Extra, Happiness, spirituality and tagged mooji. Bookmark the permalink. Would you like to be kept informed of our latest DVD's and offers? ? For every training you’ve purchased, the money will be used to make new ones.